With summer fast becoming a distant memory it’s time to embrace all things autumnal. We’ve rounded up our absolute favourite buys of the season for you, so here is the Skytime lust list of must haves we’re coveting this September. We’ve long been fans of Crème de la Mer and this silky hand cream is our must have when the temperature plummets. Small enough to keep in a handbag, its super rich formulation is soothing and will hydrate even the driest skin. A perfect travel companion. With balmy evenings a distant memory, everyone needs a cosy piece to keep out the chill as the evenings draw in. For us, there is no better option than a fabulous cashmere cape or scarf that can be effortlessly thrown over any outfit for instant warmth. We’re loving the new season range from Scottish brand Brora. We were excited to read earlier in the year of the limited edition release from the Yamazaki distillery. Renowned for its multi award winning single malts, the Yamazaki 2017 is a blend of young single malts aged in American oak and ex-bourbon barrels with single malts aged over 20 years in a mix of European oak, sherry and port wine casks. Distinctive in both flavour and appearance, we love the rich amber colour and sweet scent. We think we’ve stumbled upon the ideal fireside tipple for this autumn. We’re utterly fascinated by the latest product launch over at Jo Loves. The brainchild of Jo Malone, the fragrance paintbrush is billed as a new and innovative way to wear fragrance through the application of a quick drying gel formula via a paintbrush. Offering a more selective and precise way of applying perfume, there are four fragrances to choose between. Personally, we’re loving Green Orange and Coriander, a scent for both men and women that marries sweet citrus with punchy spice. 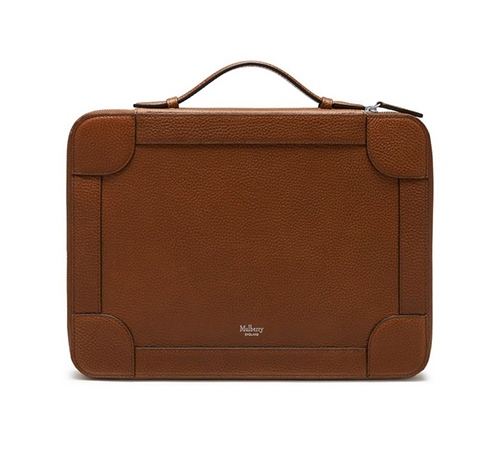 Whether your paperwork is business or leisure related, we love the new range of document holders from Mulberry that will contain your laptop and loose sheets, stylishly. Available in a range of natural leathers it’s our equivalent of a back to school essential this September.